What are the operating hours of KGI Securities (Singapore) Pte. Ltd.? KGI Securities (Singapore) Pte. Ltd. operates from Monday to Friday, 9.00 am to 6.00 pm. However, our Dealing Desks provides 24-hour broking, execution and clearing services to all clients, even on Singapore public holidays. What licenses do KGI Securities (Singapore) Pte. Ltd. hold? KGI Securities (Singapore) Pte. Ltd. holds the Capital Market Services (CMS) license under the Monetary Authority of Singapore (MAS) and the Commodity Broking License under International Enterprise (IE) Singapore. We are also a clearing and trading member with Singapore Exchange Derivatives Trading Limited (SGX-DT) and a general clearing member of ICE Futures Singapore (Formerly SMX). Are my funds safe with KGI Securities (Singapore) Pte. Ltd.? Yes, your funds are safe with KGI Securities (Singapore) Pte. Ltd.. All customer funds are segregated from the company’s account and maintained in a Trust Account. KGI Securities (Singapore) Pte. Ltd. keeps clients’ funds in a trust account, which are not commingled with its own house funds. This is in accordance with section 104 of the Securities and Futures Act (‘SFA”) which requires that a CMS license holder to handle clients’ monies and assets in line with regulations prescribed by the MAS. In addition, section 104A of the SFA provides that clients’ monies and assets cannot be used for payment of the CMS license holder’s debts. What are the margin requirements for the contracts that I wish to trade? You may find more information related to First Notice and Last Trading Day from our contract specifications webpage or you may call our Dealing Desks. Where can I find more information on Futures trading? For more information on Futures trading, you may visit our Products page and Product FAQ section for more information. What kind of basic trading approaches are there? There are basically two trading approaches, short term trading and long term trading. In general, short term trading includes taking a position for a few minutes, an hour or a day while long term trading can stretch from several days to several weeks. Who can I contact for enquiries on trading? For information on how to start trading, you may contact our Marketing Desk at +65 6202 1188 or email [email protected]. What are the main risks involved in trading derivatives such as futures with KGI Securities (Singapore) Pte. Ltd.? Transactions in leveraged futures and commodities carry a certain degree of risk. Due to it being highly leveraged, a relatively small market movement will have a proportionally larger impact on the funds you have deposited or will have to deposit. This may work well for you as well as against you. In addition, certain-reducing orders or strategies such as the placing of stop loss orders or stop limit orders may not be effective because market conditions may make it impossible to execute such orders. After receiving a margin call, do I still need to top up my funds if market movement goes in my favour? If the market movement is in your favour and it covers the margin call amount at market close, you need not top up funds for margin call. 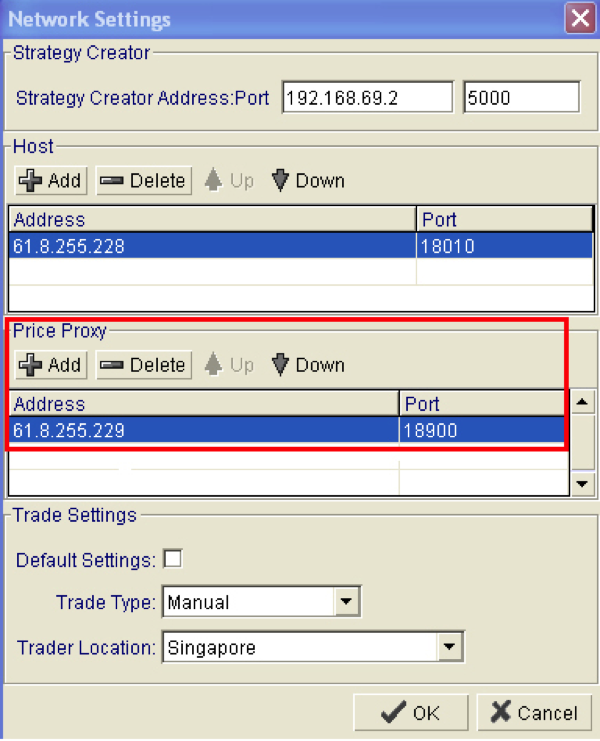 How can I open a trading account with KGI Securities (Singapore) Pte. Ltd.? 1) Online Account Opening Form - Please visit here, select“Apply Online”under the type of trading account you wish to open and fill up the form accordingly. Proof of address within last 3 months, e.g. Utility Bill, Bank statements. What are the additional procedures for non-face-to-face account opening? Our Operation Department personnel will contact you through telephone call to verify your identity. Following the verification-call, the customer is required to provide the necessary supporting documentations by mail to the Company, before opening the account. Verification of customer’s identity is necessary in carrying out customer due diligence. How long does it take to process the account opening? The normal processing time is between 3 to 5 business days, upon the receipt of all necessary documents and the clearing of the initial deposit. What is the trading limit? The trading limit depends on the amount of capital deposited, and subject to the exchange prescribed position limit. For details, please contact our Risk Management Department – Credit Team at +65 6202 1748/ 1749. Where can I view my daily account statement? You will receive daily statements via email. You may also view your daily statement via our website and click on login, followed by KGI E-Statement. You will need to enter your User ID and password to login. Will interests be charged to my account if it is in deficit? Any deficit currencies will be charged interest on a daily basis. Will KGI Securities (Singapore) Pte. Ltd. execute auto currency conversion to cover the deficit? KGI Securities (Singapore) is unable to do any conversion without the client’s consent. Clients may call the Forex Desk at +65 6202 1838 for the latest conversion rates. How do I top-up my KGI Securities (Singapore) Pte. Ltd. Account? Simply make a Telegraphic Transfer and you're ready to start trading. You are free to withdraw your funds anytime, click here. Can I use other currencies to top-up my account? We accept currencies other than SGD and USD. You can download our funding instructions here for the full list of acceptable currencies. Otherwise, you can contact our Operation Department at +65 6202 1730/ 1731/ 1732/ 1733 or email [email protected]. Withdrawals can be made by contacting our Operation Department from Monday to Friday, 9.00am to 5.30pm. Please note that withdrawal instructions received after the cut off time of 11:00am (Singapore time) can only be processed the following working day. How long does KGI Securities (Singapore) Pte. Ltd. take to process withdrawals? - Withdrawal requests received before 11:00am (Singapore time) will be processed within the same day. - Withdrawal requests received after 11:00am (Singapore time) will be processed the next business day. - Withdrawal requests will be processed within 1 to 2 business days. How can I update my personal particulars such as contact number and employment details? You can update your personal particulars at our office or by downloading the Update Particulars Form and submitting it to us in person, via email or via mail along with a copy of your Identification Document (Identity Card – for Singaporean/Singapore PR/Malaysian or Passport – for other Nationality). Please ensure that your signature on the form is consistent with the signature in our records to prevent any delays in processing. *Kindly be informed that for the update of name/IC Number/Passport Number/Nationality/PR Status/Signature, face-to-face verification is required in the presence of an Account Management Officer. A futures contract is an agreement to buy or sell a specified amount of a commodity at the specified price on a specified future date. A commodity can be tangibles such as gold, crude oil, grains, livestocks, oil seeds, etc. or intangibles such as stock indices, currencies, and interest rates. What is a Stock Index Futures contract? A Stock Index Futures contract is a legal binding agreement between two parties to buy and sell the underlying index, at a price agreed upon today, at a future delivery date. Unlike the commodity futures, the Stock Index Futures are settled in cash because it is impractical to physically deliver the underlying index at expiration. What can the Stock Index Futures do for you? Stock Index Futures are highly flexible risk management tools because of their liquidity, small bid-ask spreads, low transaction costs, ease of adjusting position and ability to move funds quickly into and out of an investment. They also serve as short-term substitutes for positions in the underlying stock markets. With Stock Index Futures, you can eliminate, acquire or adjust exposure to overall stock market fluctuations in a cost-effective manner. What are the differences between stock ownership and stock index futures? There are rules restricting short selling and the borrowing of scripts for delivery. This may not be cheap or easy. If you have a bearish sentiment of the market, you may profit from it by selling the Stock Index Futures. Most investors buy stock on a full paid basis. For those who trade on margin, asset backing may be between 10% and 50% of the total stock holdings. A nominal margin deposit allows you to control stocks worth as much as 40 times the value. Therefore, your money works harder for you. A bid-offer spread and commission to broker constitutes transaction costs of 0.2% to 0.5%, depending on the price of the stock. Buying and selling a Stock Index Futures contract is based on a simple concept. As such, you would pay lower transaction costs of less than 0.5%. What are the trading hours of the various contracts traded? You may refer to contract specifications for details. How can trading in Stock Index Futures benefit me? By trading Stock Index Futures, you can easily participate in the various equity markets without having to trade individual cash stocks. You may buy or sell first to initiate a position, depending on market conditions and on whether your view of the overall market sentiment is bullish or bearish. What should I do to place my orders? You may trade electronically via one of our online trading platforms or call our 24-hour Dealing Desks. A currency futures contract is a contract to exchange one currency for another at a specified date at a price that is fixed on the purchase date. Usually, one of the currencies is the USD. What can the Currency Futures do for you? The currency market is the world’s largest and most liquid financial market. Financial institutions, investment managers, corporations and individual investors trade currency futures to manage risks and capture potential opportunities associated with currency rate fluctuations. What are the Currency Futures contracts available? Some of the more popular currency futures contracts are traded at the Chicago Mercantile Exchange. The currencies commonly involved are US Dollar, Euro, Japanese Yen, British Pound, Swiss Franc, Canadian Dollar, New Zealand Dollar and the Australian Dollar. Interest rates can be loosely defined as the price of money and are determined by the market forces of supply and demand. They influence personal and commercial activities, such as the cost of a home mortgage, the charge applied to a credit card balance or the interest received on a savings account. Interest rate futures offer investors an advantageous means to protect their interest rate related assets and liabilities from the impact of volatility by locking in interest rates in advance. It also provides traders the means to profit from the accuracy of their market views on interest rate movements and their evaluations of interest rate pricing. You are bullish on the Singapore stock market and wish to participate in it. You have traded stocks before but you find that picking a profitable stock is difficult and time consuming. The broad market and indices have gone up but the stock you picked did not. You may even need to limit your investment to only a few selected individual stocks because you want to maximise the use of your limited capital. You can buy the SiMSCI. You are bearish on the Singapore stock market and are concerned about the stock portfolio you are holding. You either sell your stocks now or just hope for the best. You feel you are holding good quality stocks but current market sentiments and / or performance of other co-related stock markets may cause the prices to slide. You can sell the SiMSCI to hedge your stock exposure. By selling the SiMSCI, SiMSCI Futures offers the ultimate solution and alternative for your investments. Together with other attributes, the flexibility, affordability and broad market exposure of Stock Index Futures enable you to tackle the situations highlighted above. What is the margin requirement for buying options? The buyer only pays the premium of the options. What is the margin requirement for selling options? A full margin equivalent to that of the underlying futures contract is typically required for the margin of selling options. 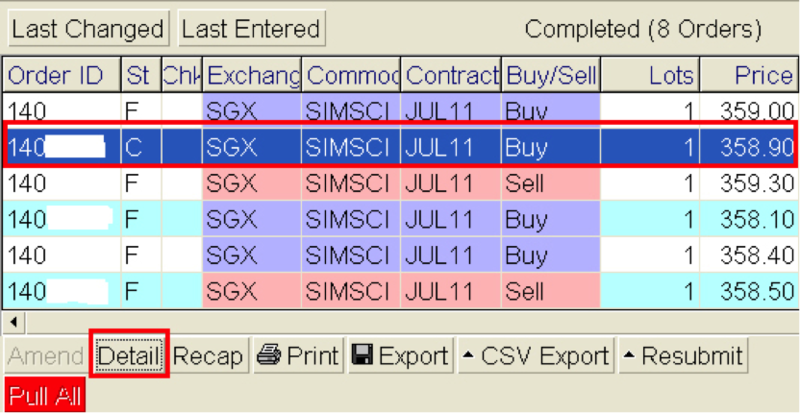 This is calculated and computed by the SGX SPAN system for options margining. Do I need to pay commission for options? Yes, trading options works the same way as trading futures. Do I still need to pay commission after the option has expired? No, because the option value depreciates with time and it becomes worthless at expiry. What is the purpose of trading options? Trading options gives the buyer the right to buy or sell a specific asset at a predetermined price on a future date. It is different from futures trading in that the buyer of options is not obligated to buy or sell the underlying at the exercise price and can choose to do so only if it is profitable. Anyone, from speculators, arbitrageurs to hedgers can use options to take advantage of the price discrepancy or hedge against price fluctuations. How do I trade options? You may buy or sell a call or put option to open a position and execute an opposite trade to close out the position. What are the benefits of trading options? Options are flexible because they allow you to tailor the exposure and risk you wish to have for an anticipated move in the options price. Trading options allows you to gain leverage without committing to a trade in a contract. As the buyer of an option, your risk is limited to the option premium. Moreover, when it is not favourable to change the underlying position, trading options allows investors to protect their positions against adverse price fluctuations. What are the advantages of writing options? Writing an option provides one with an additional source of income arising from the premium received from the buyer of the option. The premium also serves as a cushion against the risk exposure one would incur. What are the risks of buying options? Option is a wasting asset that has no value once it expires, hence the risks involved is that of losing the premium in a relatively short time frame. Is option an exchange traded product or an over-the-counter (OTC) product? Option is an exchange traded product as well as an OTC product. What types of options contracts are traded on the Singapore Exchange (SGX)? Contracts traded on the Singapore Exchange Ltd (SGX) include the Eurodollar, Euroyen TIBOR, Euroyen LIBOR, 10-Year Japanese Government Bond, Mini 10-Year Japanese Government Bond, Nikkei 225 Index and MSCI Taiwan Index. More information can be found on the SGX website. Are options available for all futures contracts? Not all futures contracts have options. The full list of options offered by KGI Securities (Singapore) Pte. Ltd. can be found here. Is margining required when I trade options? Yes, margins have to be paid when you trade options. Margin requirements represent the good faith deposits put up by Clearing Members and their customers to guarantee the performance of the obligations associated with their futures or options on futures positions. Margin is one of the financial safeguard systems that protect the integrity of Singapore Exchange Derivatives Trading Limited (SGX-DT) futures and options markets. The minimum margin level is determined by Singapore Exchange Derivatives Clearing Limited (SGX-DC) based on historical price change, volatilities and other factors SGX-DC deems relevant for all futures and options contracts. Is the margin for buying options the same as that for selling options? The margins for buying options and selling options are different. The margins for selling options are higher as more risks are undertaken. On the other hand, margins for buying options are derived from the premium paid multiplied by the contract size. Do options move as much as their underlying (futures)? Options do not move as much as their underlying (futures) unless they are in-the-money and/or very close to expiration. The amount an option can be expected to move given a 1-point move in the underlying is called delta. Delta fluctuates with time to expiration and the volatility of the underlying. Do most options expire worthless? No, this is not always the case. Approximately 55% of options are closed out before expiry, around 15% are exercised and around 30% expire worthless. Market makers are professional traders, approved by the Exchange to send in orders to buy and sell specific series of options. To do so, they need to provide sufficient liquidity in such series. Will I lose my investment if I buy an option and forget to exercise it at expiry? Options that expire on the same day as the underlying futures: request to exercise such options (whether at-the-money or out-of-the-money options) on expiration day are prohibited. Options that do not expire together with the underlying futures: request to exercise such options are allowed. Can I sell an option without owning it? Yes, you can sell an option which you do not own. How can I cancel my option obligations? You can cancel your obligation as an option holder or writer by squaring your position before the expiration date. The most popular physical commodities contracts can be broken down into several broad categories: metals, energy, grains, livestock, and food and fiber. Commodities are not paper assets, and in general, are produced and consumed at a price based on the forces of supply and demand. What is a commodity futures? A commodity futures contract represents an agreement to buy or sell a specific type and grade of commodity for delivery at a specific time in the future at an agreed upon place at a specified price. In reality, commodity futures rarely lead to the delivery of the actual product, because the contract positions are typically closed out before the delivery date. Commodity trading involves undertaking an agreement to buy or sell a specified amount of a commodity at a fixed price and date. By doing this, sellers can lock in a price for their products while buyers can avoid the risks of price fluctuations of the products. In all futures markets, trading decisions are made in two ways - fundamental or technical, although many traders use a combination of both. Fundamental analysis: Includes all factors that influence supply and demand. For the physical commodities markets, fundamental factors include weather and geopolitical events in producing countries - outside forces that influence price action. Technical analysis: Technical analysis is based strictly on inside market forces. It involves tracking various price patterns and volumes that occurred in the markets in the past. Analysts focus on a variety of time frames, and trading decisions are based on past tendencies with the idea these price patterns tend to repeat themselves. What are the commodity products offered by KGI Securities (Singapore) Pte. Ltd.? Energy Futures contracts: Crude Oil, Brent Crude, Mini Crude Oil, Natural Gas, Mini Natural Gas, Kerosene, Gasoline. Metal Futures contracts: Gold, Mini-sized Gold, Silver, Mini-sized Silver, Copper, Palladium, and Platinum. Agricultural Futures contracts: Corn, Cocoa, Coffee, Cotton, Soybeans, Soybean Oil, Soybean Meal, Oats, Orange Juice, Sugar, Wheat and Red Hard Winter Wheat. How is the physical commodity delivery made on the Exchanges? Based on the specifications of the Exchange, the seller can state his intention to make physical delivery on the Exchange. The seller has to inform the Exchange that he wants to deliver the product and does so at an assigned warehouse. The goods that are stored in the warehouse are verified by an approved assayer and a certificate is given to the seller. What are the Gold/Silver contracts offered by KGI Securities (Singapore) Pte. Ltd.? How are the interests on Gold/Silver contracts calculated? Interests are calculated based on the prevailing interest rates of Spot Gold/Silver in the market and the daily settlement price of your Spot Gold/Silver overnight position. When do I incur or earn interests? You earn interests if you short Gold (long USD) while you incur interests if you long Gold (short USD).The scenarios above depend on the current Spot Gold interest rates. How much commission do I need to pay per trade? The commissions you pay differ between the various products and Exchanges. We offer very competitive rates across all products. The commissions and margins required may change from time to time based on Exchanges requirements and the company’s policies. Please call us at +65 6202 1188 or email us at [email protected] if you need further assistance. Can I appoint someone to trade on my behalf? Yes, you may wish to appoint a Power of Attorney (POA). You and the appointed party are required to sign the Power of Attorney Form. In the event that you wish to revoke your mandate, you can send us a letter of mandate revocation. Licensed persons (financial advisory or fund management Services). How is futures trading different from share margin financing? Futures trading allows you to trade various futures contracts listed on futures exchanges & over-the-counter (OTC) Commodities/foreign exchange on a margin basis. The transactions in futures are usually highly leveraged. You may need to put in only a very small percentage of margin deposit instead of paying for the full contract value. You are not allowed to trade without a margin deposit. What is long and short position? Buying a futures contract is called taking a long position. Selling a futures contract is referred to as taking a short position. A long futures position profits when the futures price goes up, and a short futures position profits when the futures price goes down. How do we calculate profit and loss? All orders can be placed through phone or executed through our E–trading platforms. What are "Spot" and "Futures" prices? Spot price is the price in the cash market (where one buys and sells goods 'on the spot' just as we make purchases from a shop by paying cash) while futures prices are prices of the same commodity at a future date. The difference between spot and futures prices is the cost of carry i.e. interest cost, storing, insurance etc. How do I place a trade via phone call? Simply call our Dealing Desks, state your account number, order, contract month (Futures trading), quantity, and order buy or sell. How can I confirm that the orders I placed are done? You may call our Dealing Desks to confirm the trades done. Will I receive confirmation for my trades executed? You will receive your daily, monthly and quarterly statements via email or hardcopy. The daily statements reflect the previous day’s trades, open positions and your account balances marked to the previous market close. Your trading activities and commissions are summarized in the monthly and quarterly statements. No daily statements will be sent to dormant accounts. How do I know my Net Position? You may call our Dealing Desks to check on your Net Position. Margins are likened to a performance bond – a good faith deposit – to ensure the ability of market participants to honour their financial commitments and cover any obligations which may arise out of the trading activities. When will I have a margin call and how much do I need to top up into my account? Margin Call will be initiated when the total net equity (cash + unrealized Profit and Loss) falls below the maintenance margin. Your open positions are marked-to-market to the closing prices each trading day. At most times, the Initial Margin (IM) is sufficient to buffer some losses. However, when your losses deplete your equity below the Maintenance Margin (MM) required, you will then receive a margin call, which requires you to top up your equity to the Initial Margin level. How can I top-up my account for margin call? Please refer to Accounts FAQ under Top-Up and Withdrawal Section. By when do I need to top-up for my margin call? Under normal market conditions, you may have up to Trade date + 2 business days to top-up your account for margin call. KGI Securities (Singapore) Pte. Ltd. margin call policy prevails, for details please contact our Risk Management Department – Credit Team at +65 6202 1748/ 1749. What will happen if I do nothing to my margin call? KGI Securities (Singapore) Pte. Ltd. reserves the right to impose stop loss order on your open positions. However, KGI Securities (Singapore) Pte. Ltd. will make reasonable attempts to contact you on the stop loss level on a best effort basis. As KGI Securities (Singapore) Pte. Ltd. margin call policy prevails, we reserve the right to liquidate the position(s) to bring your equity balance above your Initial Margin level. If I have an outstanding margin call, can I still trade? No, you are not allowed to add-on risk incurring position. Under such a situation, you can only liquidate the position. Who do I contact for details of KGI Securities (Singapore) Pte. Ltd. margin call policy? For details on our margin call policy, you may contact our Risk Management Department – Credit Team at +65 6202 1748/ 1749. 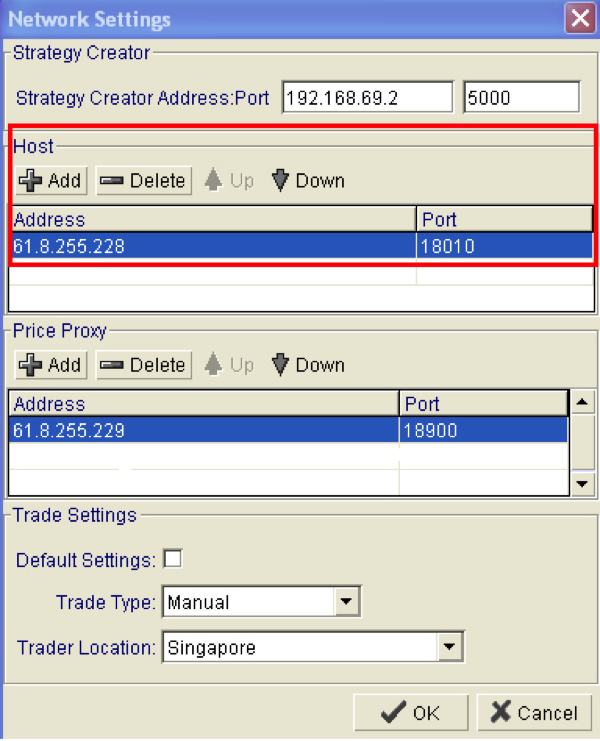 How can I verify if the trades shown in my account are done by me? You may call our Dealing Desks to check your trades done with the Dealers. How can I verify if the execution price the Dealer placed for me is correct or wrong? You may call our Dealing Desks to verify the order price. Day orders are valid until that day’s New York market close or London market close if it is a New York holiday. GTC orders are orders that are valid until the orders are filled or until they are cancelled by you. Market orders are to be transacted at the prevailing price in the market. To do a Forex market order, you have to call our dealer to give you a FIRM or DEALING quote. Prices are quoted in the sequence of Bid vs. Offer. Firm quote will hold only for a short while. Once a firm quote is quoted, you have to decide either to buy (at the offer price), sell (at the bid price) or do nothing before the dealer invalidates the quote. For Futures orders, please note that you may be put on the line while the dealers get your transacted price. Limit orders are price-specific orders that are placed away from the current market price. It gives you more control over the execution price. The price of a limit-buy order is lower than the current market price, and may be filled at the limit price or higher. Stop orders are orders that become market orders when the market reaches a designated price. The price of a buy stop order is lower than the current market price, and may be filled at the specified stop price or higher. The price of a sell stop order is higher than the current market price, and may be filled at the specified stop price or lower. An OCO order is an order which allows you to place a Limit Order and a Stop Order at the same time. When one order is done the other order is automatically cancelled. 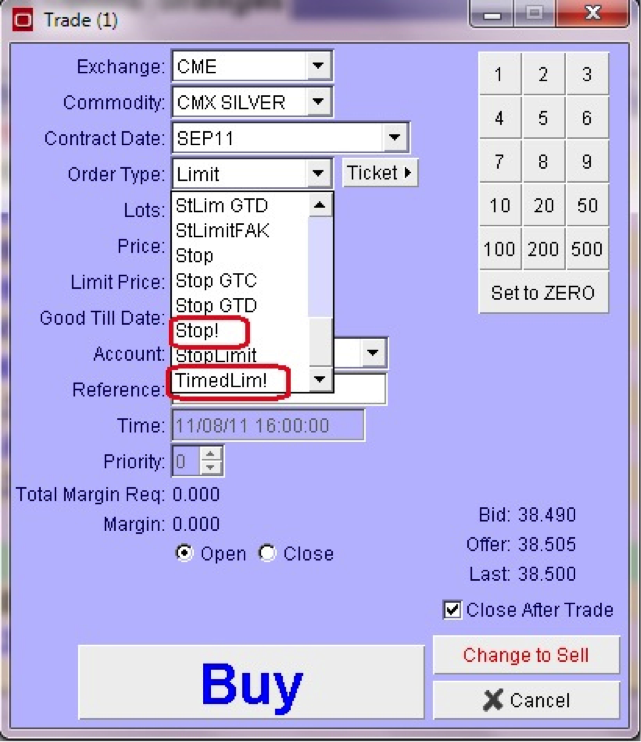 For example, if the limit order is filled, the stop order is automatically cancelled, and vice-versa. Where do I install the latest version of the KGI Futures or other trading systems? KGI Futures is an application-based system. Users will be informed when a major release is available and advised where to obtain it. Should you have a change in email address, kindly update us at [email protected]to ensure that you receive the latest news. Do KGI Futures or other trading systems work on Mac? KGI Futures and CQG run on only Windows PC. For more information, please visit our platform comparison page. Can I have a 1-to-1 session to learn how the platforms work? Yes. Please contact the Marketing Desk at +65 6202 1188 or email [email protected] to make an appointment. Is there a fee for using KGI Futures and other trading systems? What should I do if I have forgotten my password for KGI Futures system? To reset your password, kindly get your User Name ready and contact our IT help Desk at +65 6202 1879. You will be prompted to change your password upon the first login after reset. Your new password must be alphanumeric and not be any previously used password. What should I do if I encounter an error message when attempting to start my KGI Futures system? Java installation is required for the KGI Futures system to start properly. If you encountered the error message shown in the screen shot below, please visit this link and click on “JRE” to download Java. Why does my KGI Futures system keep getting disconnected? Yellow – Please click on settings and ensure the IP addresses and ports are similar to the second screenshot below. Red – Please check the internet connection of your modems, cables or wireless devices. What should I do if the price feed for a market or contract is not updated in my KGI Futures system? Please ensure that you are logged in. What should I do if my trade keeps remaining in “S” status or being rejected “R” in my KGI Futures system? Information in the red boxes will be required for tracing the trade and resolving the issue. What do the status “S”, “C”, “R” and “F” mean (refer to screen shot below) in the KGI Futures system? What is the difference between orders with signs (for example, “#”, “!”) and those without signs? a) Orders without signs : exchange accepted orders. b) Orders with signs : synthetic orders, which allow traders to have more options on order types. 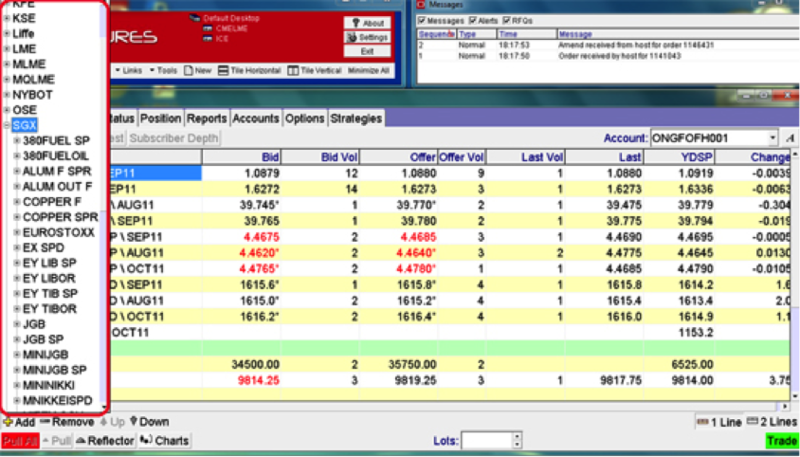 d) Order types with “!” : reside in the trader’s computer. What should I do if the net change/ price reflected is incorrect or not updated? Please check “YDSP” price (In the screen shot below), if the price shown is incorrect or not updated properly, call our IT help Desk at +65 6202 1879 for assistance. What should I do when my order type is not working? Some order types may not be available in the system. For more information of the different types of orders which are available, please contact our Dealing Desks. What should I do when my contract is not displayed in the system? Please log out, login and check your contract again in the left most panel (shown in the screen shot below). If you still cannot view your contract after several attempts, please call our IT help Desk at +65 6202 1879. Where can I find more troubleshooting information for other platforms? Please contact the Marketing Desk at +65 6202 1188 or email [email protected] for more information. Two Factor Authentication (2FA) is an optional security measure that KGI Securities (Singapore) is implementing to enhance the security of online trading. This feature generates a unique dynamic security code, also known as a One-Time Password (OTP) to validate and authenticate the user’s access on our trading platform(s). Upon the setup of 2FA, you will require the following to login to your trading account. Is 2FA setup compulsory for all clients? No, 2FA is an optional security feature for our clients. Clients who wish to have an extra level of security on their account(s) can follow the steps in the attachment to set up 2FA. Are there any changes to the current online trading services? No, there are no changes to the current online trading services. The 2FA implementation will only affect the way you access your account. Do I have to pay for the 2FA feature? No, the 2FA feature is a complimentary security feature we offer to clients for free. An e-Statement is an electronic version of your client statement that we send you via e-mail. Do I need to enter my password when viewing my e-Statement? Yes. You are required to enter your password whenever you wish to view an e-Statement that is sent to your mailbox. What is my e-Statement password? *Do note that the e-Statement password is case-sensitive. Can I change my e-Statement password? Yes. Kindly inform us via e-mail at [email protected] or speak to your account manager. How do I register for this encrypted e-Statement service? You do not need to register for this service as this is an additional security feature that we will be implementing for all documents that contain our clients' sensitive information. Do I need special software to view my e-Statements? All e-Statements will be sent in PDF format. To open an encrypted e-Statement document, please use Adobe Acrobat Reader version 8.0.0 or above. You may not be able to open your e-Statement if you are using a lower version of Adobe Acrobat Reader, The latest version of Adobe Acrobat Reader can be downloaded from www.adobe.com for free.